‘An intriguing story that promises to be the start of a series’ according to the editorial intro., and that pretty much sums it up. Reed slowly reveals just enough juicy snippets of information to keep the reader interested. A small, tight-knit community of woods-dwelling humans/elves/creatures forage from the ‘big people, who are obviously human beings. A hard winter proves fateful, and the youngster Raven finds himself having to reveal himself in order to save a friendly human. But very much the first chapter of a novel, as opposed to a true singleton short story. An ‘interesting’ story of two halves. The longer half (actually, the first 3/4) could almost be a verbatim transcript from a stand-up comedian of the ‘observational comedy’ camp, describing the fun which can be had at the expense of door-to-door salespeople. This goes on for rather too long, and the much shorter final section in which a quantum experience befalls the woman whose work is being interrupted by said salespeople is too short to be telling. Know How, Can Do. Michael Blumlein. In the last Blumlein story from F&SF (Paul and Me, collected in the 50th anniversary F&SF volume, we had Paul Bunyan in a homosexual relationship which proved true the adage that size doesn’t matter. ROTFL. Here we have a story where the main character is somewhat smaller – a humble worm. Well, a worm that is no longer humble – for the worm in question is a research lab who has been genomically grafted to a human brain and ergo can think. I think, therefore I am, is the fundamental premise of the worm’s existence, and we get a true worm’s eye view of his perspective on life. One of those stories you will either love or hate. I loved it. The Shadow. Thomas M. Disch. Classic(al) SF from Disch – something that could be a reprint from the 1950s in its Twilight Zoney feel. Angie is afraid of her shadow – and with good cause, as when her shadow is able to detach itself from her and to take her over, it is her dark side which has the ascendancy. And the true horror of Angie’s fate (regular sexual abuse as an Alzheimer’s patient in a very unpleasant residential facility) is chilling to the max. Timmy Gobel’s Bug Jar. Michael Libling. Very much in the Stephen King vein of youth and horror combined. In the late 1950s a group of youngsters find something most peculiar in the bug jar to which the title refers. A skeleton. A very small, human skeleton. As if that isn’t freaky enough, the skeleton is…. re-generating? The specimen is taken to school to be shown to a teacher, and all hell breaks loose! 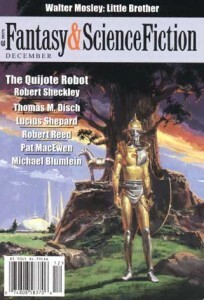 The Quijote Robot. Robert Sheckley. Another SF master displays his talents. A quixotic tale – a robotic Don Quijote, astride a similarly mechanical mare, is on his knight’s errant task to defend the name of his beloved Princess, Psyche. Recruiting a human Sancho Panzo, and further help of a rodent nature, he tilts not at windmills but at the Boss Robot at the Robot Factory. The finale comes across almost as a Sonic vs Robotnik battle! A good issue. Some well written stories – little in terms of SF, but sufficiently different to engage.